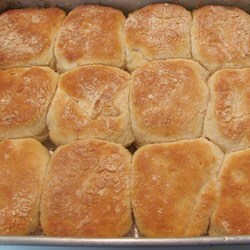 These biscuits are delicious and not as fattening as the recipe might lead you to believe. That stick of butter is allotted through the whole recipe and the biscuits are so tasty that you won’t need any toppings! Preheat oven to 425 degrees F (220 degrees C). Put butter in a 9×13-inch baking dish and place dish in the preheating oven until butter is melted. Mix baking mix, lemon-lime soda, and sour cream together in a bowl until dough holds together and is sticky. Turn dough onto a floured work surface and roll into 1-inch thick circle. Cut circles out of dough using a cookie cutter or the rim of a wine glass and place in the melted butter. 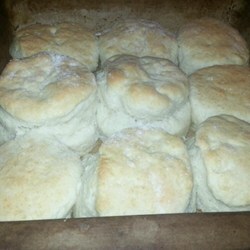 Bake in the preheated oven until biscuits are golden brown, 10 to 12 minutes. Remove dish from oven and let stand until biscuits have absorbed all the butter.